Tuberculosis (TB) of the bones and joints is rampant in India with the dorsolumbar spine as the most common site of osseous involvement. For diagnosis, clinical suspicion needs to be confirmed through appropriate laboratory and imaging investigations, and increasingly nowadays, nucleic acid amplification techniques. Chemotherapy remains the cornerstone of management complemented by rest, nutritional support and splinting, as necessary. Operative intervention is required if response to chemotherapy is unsatisfactory and for spinal stabilization. The drugs and regimens are fundamentally similar to those for pulmonary TB. However, there is lack of consensus on the appropriate duration of treatment. The prevailing practice of extending treatment till radiological evidence of healing is complete, may be unnecessary in view of recent reports that 6-9 months of therapy is sufficient for the majority of cases. Relapse rates are not drastically improved by extending treatment to 12 months or even longer, except perhaps in pediatric cases. However, prolonged treatment may be required if surgical debridement is indicated but cannot be done. Multidrug-resistant TB should be suspected if disease activity shows no signs of abating after 4-6 months of uninterrupted therapy. These cases are therapeutically challenging and will require second line or experimental antiTB drugs, supported by resistance testing where feasible. Coexistent HIV/AIDS may also necessitate prolonged treatment. 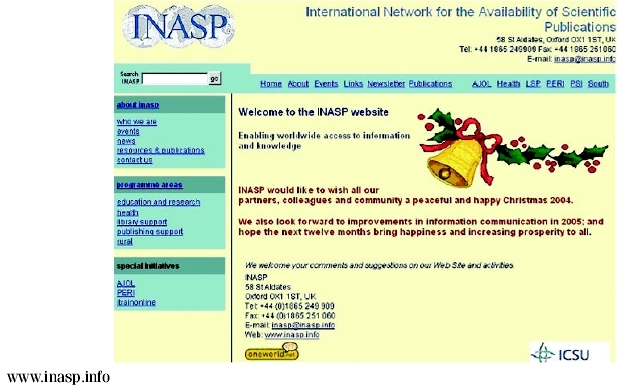 Interactions between first line antiTB drugs and antiretroviral medication can complicate matters. Close monitoring is essential in all cases, with dechallenge and cautious reinstitution of drugs in the event of toxicity. While awaiting the arrival of long overdue new antiTB medication, existing drugs and regimens must be used in an informed manner with emphasis on patient compliance. OBJECTIVE: To study the effect of folate treatment on homocysteine (HCY) levels in patients with Coronary Artery Disease (CAD). We also made an attempt to analyze HCY levels in relation to other risk factors present in these patients. MATERIALS AND METHODS: The study was a randomised, non-blind clinical trial carried out in 84 angiographically documented CAD patients and 40 controls (angiographically proved normal or treadmill test negative). Biochemical analyses of glucose, insulin, HCY, lipid profile and C-Reactive Proteins (CRP) were conducted in serum samples collected from these patients. 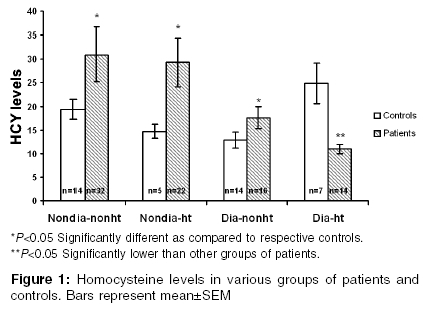 Treatment with folic acid (5 mg/day) for 3 months was given to patients with hyperhomocysteinemia and the post-treatment HCY levels were analyzed. RESULTS: The mean plasma HCY level in control volunteers was found to be 17.85±1.4 µmol/L, which was significantly lower than those in CAD patients (24.69±2.8 µmol/L). The levels were higher in non-diabetic patients (30.33±3.9 µmol/L) as compared to non-diabetic controls (18.18±1.6 µmol/L) as well as diabetic patients (14.53±1.43 µmol/L), irrespective of the presence of hypertension. No correlation was found between total HCY (t-HCY) levels and serum glucose, insulin, triglycerides, VLDL, LDL, HDL, cholesterol or CRP levels. A negative correlation was found between t-HCY levels and the age of the patients. The HCY levels were highest in the younger age group of patients (30-40 years) (49±7.8 µmol/L). There was a significant reduction in t-HCY levels after the folate treatment in mild and moderate hyperhomocystienemic patients but the reduction in patients with severe hyperhomocysteinemia was not significant. CONCLUSION: CAD patients have higher HCY levels than subjects without CAD. Indian diabetic patients have lower levels of t-HCY irrespective of the presence of cardiac disease. Folate treatment decreases the t-HCY levels in homocysteinemia and thus can be used in treatment of homocysteinemia. OBJECTIVE: To study the effect of α-cypermethrin (α-CP) on some neuropharmacological paradigms like motor coordination, pentobarbitone-induced sleeping time and pentylenetetrazole-induced (PTZ) convulsion as well as γ-aminobutyric acid (GABA) level in rat brain. MATERIALS AND METHODS: Albino Wistar rats were the experimental animals. 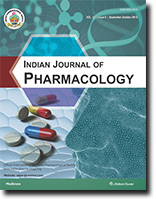 Different neuropharmacological paradigms like motor coordination (determined by rotarod), pentobarbitone-induced sleeping time and PTZ-induced convulsion were carried out following oral administration of α-CP at two dose levels i.e., 145 mg/kg (LD50) and 14.5 mg/kg (1/10LD50), while the level of GABA in the brain of rats was estimated by HPLC after single-dose oral administration of α-CP at 145 mg/kg. 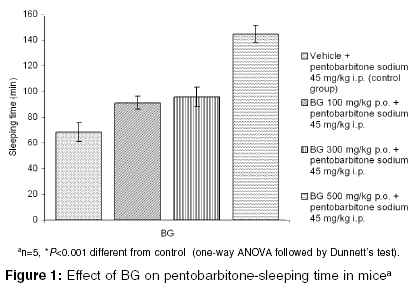 RESULTS: α-CP induced significant motor incoordination, decreased the time of onset and increased the duration of sleeping time induced by pentobarbitone; and also decreased the time of onset and increased the duration of convulsion induced by PTZ at the dose levels of 145 mg/kg (LD50) and 14.5 mg/kg (1/10 LD50) respectively. Further α-CP decreased brain GABA levels in the cerebellum and in whole brain (except cerebellum) significantly at LD50 dose level. CONCLUSION: A correlation between the effect of α-CP on central GABA levels and its neuropharmacological effects can be hypothesized. OBJECTIVE: To evaluate the antibacterial potential of aqueous and acetone extracts of galls of Quercus infectoria by determination of Minimum Inhibitory Concentration (MIC) and Minimum Bactericidal Concentration (MBC) values. MATERIALS AND METHODS: The extracts from the galls of Q. infectoria at 10 mg/ml were screened against three Gram-positive bacteria (Staphylococcus aureus ATCC 25923, Staphylococcus epidermidis and Bacillus subtilis) and three Gram-negative bacteria (Escherichia coli NCTC 12079 serotype O157:H7, Salmonella typhimurium NCTC 74 and Pseudomonas aeruginosa ATCC 27853). The MIC of the extracts were then determined using the twofold serial microdilution technique at a concentration ranging from 5 mg/ml to 0.0024 mg/ml. The MBC values were finally obtained from the MIC microtiter wells which showed no turbidity after 24 hrs of incubation by subculturing method. RESULTS: Out of the six bacterial species tested, S. aureus was the most susceptible. On the other hand, the extracts showed weak inhibitory effect against S. epidermidis, B. subtilis, S. typhimurium and P. aeruginosa while there was no inhibition zone observed for E. coli O157. The MIC values of the extracts ranged from 0.0781 mg/ml to 1.25 mg/ml whereas the MBC values ranged from 0.3125 mg/ml to 2.50 mg/ml. The MBC values of aqueous extract against S. aureus and S. typhimurium were higher than their MIC values. The MBC value of acetone extract against S. aureus was also higher than its MIC value. Interestingly, however, the MIC and MBC values of acetone extract against S. typhimurium were the same (1.25 mg/ml). CONCLUSION: The aqueous and acetone extracts displayed similarities in their antimicrobial activity on the bacterial species and as such, the galls of Quercus infectoria are potentially good source of antimicrobial agents. OBJECTIVE: To study the effect of the aqueous extract of Piper guineense (Piperaceae) on male reproductive function in Wistar rats. MATERIALS AND METHODS: Male rats, 3 months old, weighing 180-210 g were administered (by gastric intubation) the aqueous extract of dry fruits of Piper guineense at two doses, 122.5 and 245 mg/kg for 8 days and 122.5 mg/kg for 55 days. The control group received distilled water for the same duration. Animals were sacrificed and the blood, testes, epididymis, seminal vesicles and prostate were collected for biochemical analyses. RESULTS: There was a significant increase in the level of testosterone in the serum and testes, cholesterol in the testes, α-glucosidase in the epididymis and fructose in the seminal vesicles after 8 days of treatment, while with 55 days of treatment, the levels of cholesterol in the testes increased by 75%, while the levels of α-glucosidase in the epididymis and the seminal vesicle fructose decreased by 24 and 21% respectively. On the other hand, there was a 20% reduction of fertility in the P. guineense-treated rats after 55 days of treatment. CONCLUSION: The aqueous extract of P. guineense at both doses (122.5 and 245 mg/kg) had a positive impact on the male reproductive function since it stimulated the secretions of the testes, epididymis and seminal vesicles. The use of P. guineense could negatively influence male fertility. OBJECTIVE: To eavaluate the CNS activity of Bramhi Ghrita, a polyherbal formulation containing Bacopa monneri, Evolvulus alsinoids, Acorus calamus, Saussurea lappa and cow's ghee. MATERIALS AND METHODS: The effect of Bramhi Ghrita on motor coordination, behavior, sleep, convulsions, locomotion and analgesia was evaluated in mice using standard procedures. RESULTS: The formulation exhibited reduced alertness, spontaneous locomotor activity and reactivity. It also antagonized the behavioral effects of d-amphetamine, potentiated the pentobarbitone-induced sleep and increased the pain threshold. 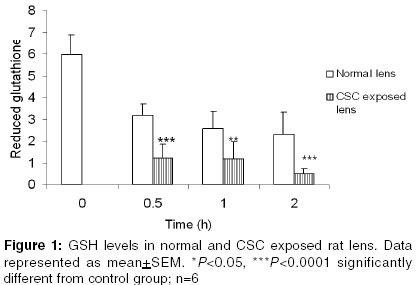 Bramhi Ghrita protected mice from maximum electroshock and pentylene tetrazole-induced convulsions.